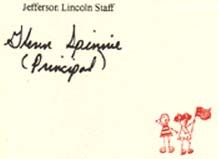 In Recognition of his valuable and Humanitarian contribution to the children of Jefferson-Lincoln Elementary School and the furtherance of their reading and writing literacy through generous financial support. 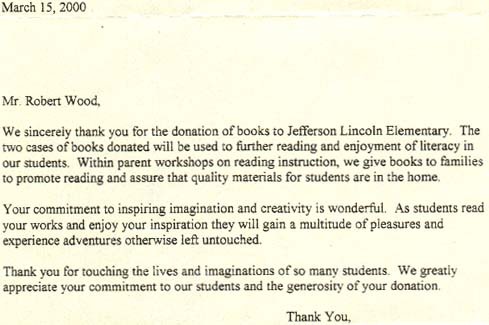 This was an exciting event as the principal and staff of Jefferson-Lincoln Elementary School in Centralia, WA awarded Robert with their thanks and gratitude. Please view some of the snap-shots from this occasion. 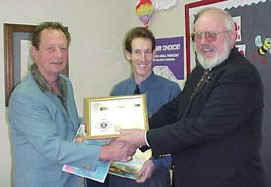 Here Robert is seen receiving the award from Jim Case of Kiwanis of Centralia. 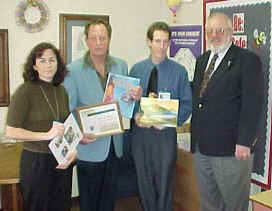 In the center is Jefferson-Lincoln Elementary Principal Glen Spinnie. 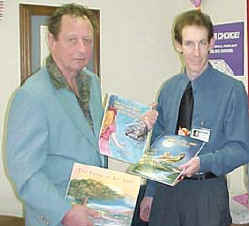 Principal Glen Spinnie takes this shot as he is looking over some of the books donated by Robert. From left to right, Brenda Deck a School Teacher at Jefferson-Lincoln, Robert E. Wood, honored guest and author, Principal Glen Spinnie and Kiwanis Club Member, Jim Case are pictured discussing the importance of a child's reading development.